Originally published under the title "Russia Devouring the Eastern Mediterranean?" Putin (left) and Erdogan in happier times. At this year's G-20 summit in Antalya, Turkey, Russian President, Vladimir Putin, said that the radical jihadist Islamic State (IS) was being financed by donors from at least 40 countries, including some G-20 member states -- clearly pointing his finger, without naming names, at Saudi Arabia and Turkey. A few days later, two Turkish F-16 jets shot down a Russian SU-24 warplane, and claimed that the Russian jet had violated Turkish airspace for 17 seconds on the country's Syrian border -- a violation Russia denies. This was the first time a Soviet or Russian military aircraft was shot down by a NATO air force since the end of WWII. Turkey and Russia have long been in a proxy war in Syria: Russia, together with its quieter partner, China, supports the Shi'ite Iran-backed Syrian regime of President Bashar al-Assad; and Turkey explicitly supports Assad's Sunni opponents ["moderate" jihadists] -- apparently in the hope of building a Muslim Brotherhood/Hamas-type of regime in Damascus that would be friendly to its own Islamist government. 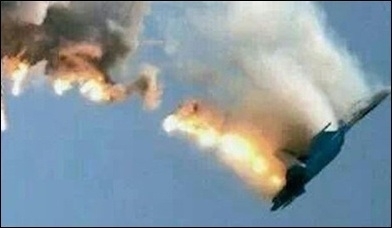 After the downing of the Russian jet, the Turco-Russian proxy war has become less proxy. Turkey and Russia have long been in a proxy war in Syria. An angry Putin called the incident "a stab in the back." He declined Turkish President Recep Tayyip Erdogan's requests to discuss the issue. He twice refused to meet Erdogan on the sidelines of the Paris Climate Summit. Russia's foreign minister, Sergei Lavrov, quickly cancelled his official visit to Turkey -- a visit that had been scheduled for the day after the downing of the Russian jet. At the outset, NATO member Turkey had taught Russia a good lesson. In reality, judging from the consequences, it all looks like a Russian gambit, with Turkey shooting itself in the foot and risking a new NATO-Russia conflict. Russian authorities detained a group of Turkish businessmen on charges of "false statements about their trip to the country." Moscow warned its citizens against visiting Turkey -- a ban that could deal a big blow to Turkey's lucrative tourism industry. Last year 4.5 million Russians visited Turkey, mostly its Mediterranean coast. Russian tour operators were warned to suspend business with Turkey. The fate of two huge Turco-Russian energy projects remains unknown, as Russia's energy minister, Alexei Ulyukayev, did not rule out sanctions hitting the Turkish Stream gas pipeline and a planned Russian nuclear energy plant in Turkey. Turkey buys about 55% of its natural gas from Russia. Its second largest gas supplier is Iran, Russia's ally -- and Turkey's rival -- in Syria. Russia's Minister of Agriculture, Alexander Tkachev, said that Russia would be replacing Turkish food imports with goods from Iran, Israel and Morocco. The Kremlin officially announced a wide range of sanctions on Turkey, including a ban on Turkish workers (with estimates that 90,000 will be fired by Jan. 1, 2016), restrictions on imported goods and services from Turkey and calls for "strengthening of port control and monitoring to ensure transport safety." In a further move to escalate tensions, the Russian General Staff deployed one of its largest air defense ships at the edge of Turkish territorial waters in the Mediterranean. Russian military spokesman General Sergei Rudskoi said that Russian bomber aircraft would be "supported by chasers, and any kinds of threats will be responded to instantly." Accordingly, The Moscow, one of the Russian Navy's two largest warships and the flagship of Russia's Black Sea Fleet, will be deployed where Turkey-Syria territorial waters connect. There have been other military repercussions, too. Since the shooting down of the Russian jet, the Russian military has been regularly pounding the Syrian villages near the Turkish border that populated by the Turkmen, a Turkish ethnicity that supports jihadists in Syria -- and is supported by Ankara. The Russians also have been hitting Turkish aid convoys bound for Turkmen villages. More than 500 Turks and Turkmen have been killed in Russian airstrikes. Meanwhile, the U.S.-led allied air strikes against IS have come to a halt. Neither Washington nor Ankara is keen for another conflict with Russia. So, IS and Russia keep on flourishing. Turkey is needlessly exposing NATO allies to the risk of a conflict with Russia. Turkey has every liberty to challenge Russia and, inevitably, become the victim. But with its geostrategic, Islamist ambitions, it is exposing NATO allies to the risk of a fresh conflict with Russia -- and at a time when the wounds of previous conflicts remain unhealed. Putin has accused Turkey's leaders of encouraging the Islamization of the Turkish society, which he said was a "problem." He was not wrong. 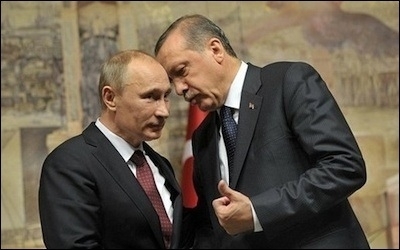 In fact, Islamism and neo-Ottoman ambitions are the source of Turkey's (not-so) proxy war with Russia in the Syrian theater. Although Turkey, officially, is a NATO member and part of the allied campaign against IS, its Sunni Islamist ambitions over Syria hinder the global fight against jihadists. A Turco-Russian conflict is weakening the fight.